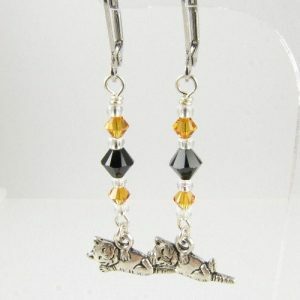 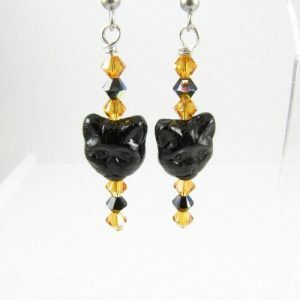 Kitten earrings – handcrafted with Swarovski bicone crystals in topaz and black and silver plated kitten charms.They hang on silver plated continental ear wires. 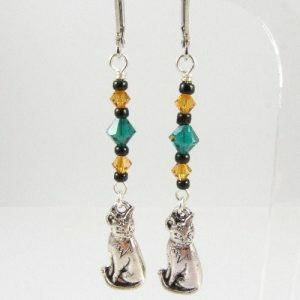 Cat face earrings in green and black – handcrafted with Swarovski bicone crystals in Emerald and black AB and black cat face beads.They hang on surgical steel ear wires. 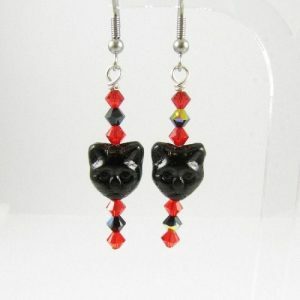 Cat face earrings in red and black – handcrafted with Swarovski bicone crystals in red and black AB and black cat face beads.They hang on surgical steel ear wires.